I was surfing the Internet today and came across an article along with this picture regarding the smart meter industry. 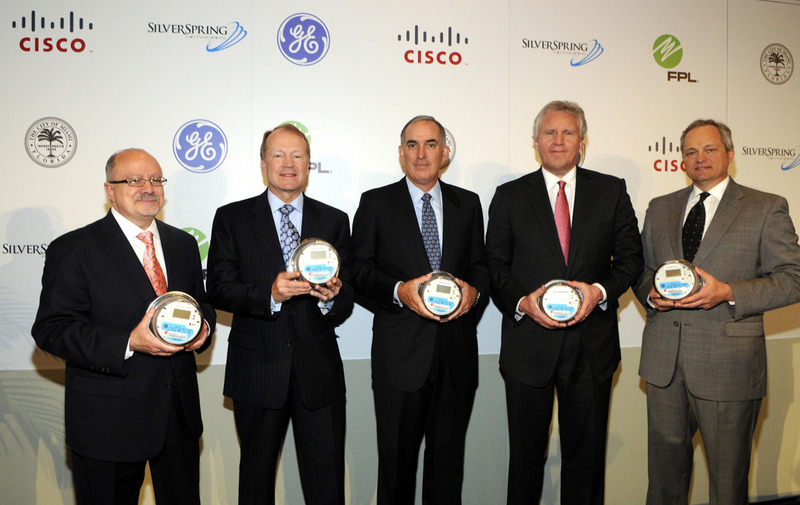 This is Miami Dade College President Eduardo Padron, John T. Chambers, Chairman and CEO of Cis co Systems, Group Chairman and CEO Lewis Hay III of Florida Power & Light, GE Chairman and CEO, Jeff Immelt and Silver Springs Networks Chairman and CEO Scott Lang displaying the new GE Smart Meter. They were announcing a new agreement between the companies that would potentially replace over 4.5 million meters with Smart Meters in the Miami area. This was not only exciting news for these companies pictured, but very exciting news for PaladinID because this Smart Meter is the first appliance to use the new label ink combination that we specifically designed for this outdoor application. This label is using a special outdoor ink that can last 5-10+ years and resist fading from the sun. This is a very big breakthrough for us. As the Smart Meter industry grows and evolves, PaladinID will be there every step of the way. For more information or samples of this new product, please email dritchie@paladinid.com or call 888.972.5234.